CNG: Printed Auction CNG 75. Caracalla. AD 198-217. Æ As (11.20 g, 8h). British victory issue. Rome mint. Struck AD 210-211. Sale: CNG 75, Lot: 1094. Estimate $500. Caracalla. AD 198-217. Æ As (11.20 g, 8h). British victory issue. Rome mint. Struck AD 210-211. Laureate bust right, slight drapery on far shoulder / VICTORIAE BRITTANICAE, Victory standing right, inscribing shield set on palm. RIC IV 521 var. (no drapery). Good VF, mottled dark green and brown patina, traces of smoothing, a few tiny pits. 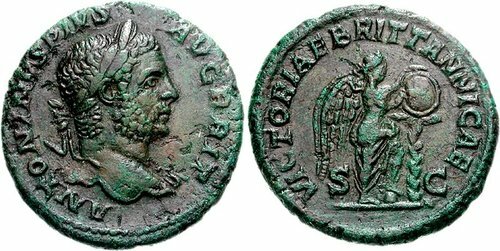 In AD 208 Septimius Severus together with the entire imperial family (his wife Julia Domna and their sons Caracalla and Geta) set out for Britain where the situation on the northern frontier demanded urgent attention. He was to spend the last two and a half years of his life in the island province and was destined never to return to Rome. Together with his elder son, the co-emperor Caracalla, he campaigned vigorously beyond the imperial frontier, penetrating far into Scotland. The line of their marching-camps can still be detected today by aerial photography. Severus also restored Hadrian's Wall, the northern frontier of the province, which was in serious need of renovation now that more than eighty years had elapsed since its original construction. Little is known of the success of these military operations, though they were to bring peace to the area for the remainder of the third century and an extensive issue of coinage in all metals was produced to commemorate the British victory.